Members of the River Valley wrestling team pose for a picture after completing the afternoon on Sunday at the 2019 Division III OHSAA wrestling dual team tournament held at St. John’s Arena in Columbus, Ohio. River Valley freshman Nathan Cadle, right, receives a congratulatory handshake from RVHS coach Matthew Huck after winning the 138-pound match against Edison on Sunday at the 2019 Division III OHSAA wrestling dual team tournament held at St. John’s Arena in Columbus, Ohio. COLUMBUS, Ohio — There are no losers at this level … only teams that come up just short of winning state titles. 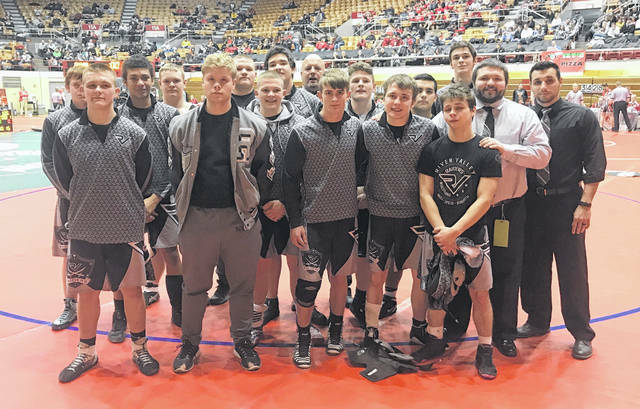 The River Valley wrestling team had its historic postseason run come to an end Sunday during the quarterfinal round of the 2019 Division III OHSAA state wrestling dual team tournament held at St. John’s Arena on the campus of the Ohio State University. The seventh-seeded Raiders — who secured the school’s first-ever state appearance in a team sport with their Region 22 championship — found the state competition to be a bit more testing, as the Silver and Black trailed 24-0 five matches in before ultimately dropping a 54-18 decision to second-ranked Milan Edison. River Valley was already in a tough spot after falling behind 12-0 after forfeiting its 106- and 113-pound bouts, then the Chargers followed with two decisions and a pinfall to double their cushion out to 24-0. Nathan Cadle put the Raiders on the board after pinning Garrett Scott in the 138 division for a 24-6 deficit, but EHS countered with two pinfalls and two decisions that increased the lead back out to 42-6 with four matches remaining. Eric Weber scored a pinfall over Jacob Thompson at 182 pounds for a 30-point contest, but Edison answered with consecutive pinfall wins to balloon its lead back out to 54-12 — its largest of the match. Christopher Goheen, however, sent RVHS out on a positive note after scoring a pinfall win over Jackson Berardi in the heavyweight match — which also completed the final 36-point outcome. The Raiders ended the day with a 3-11 overall mark in the 14 weight classes, including a 3-9 effort in actual head-to-head competitions. River Valley also had the only two forfeits in the Edison dual. RVHS coach Matthew Huck — now in his 20th season with the program — noted that the competition was fierce at this level, and that his kids struggled a bit on this grand stage. However, Huck was also very proud of his troops for getting to this point — not to mention putting themselves in a position to compete for a collective state championship. As he said afterwards, it’s still an experience that everyone will look back on someday and be very proud of — regardless the final outcome. “It’s a very proud day for us at River Valley in getting to this point. Only eight teams get here, and only one of those eight can go home as state champions. Going home without a state title doesn’t take anything away from what we have accomplished,” Huck said. “We got punched in the face a little bit today, but we’ll be better for it. We’ll shake this off and bounce back, hopefully go to the TVC meet and sectionals and see if we can produce some more good memories this season. Genoa Area ended up repeating as Division III champions after knocking off Edison by a 52-23 count in the finals. Genoa defeated Rootstown (55-13) and Edison — the 2017 D-3 dual champions — beat Versailles (45-23) in the semifinal rounds. Genoa beat Pleasant (72-6), Rootstown defeated Blanchester (45-25) and Versailles topped Crestwood (40-29) in the other quarterfinal matches in Division III. St. Paris Graham notched its seventh consecutive state dual championship since the tournament started in 2013 after posting a 38-24 win over Aurora in Division II. Graham won D-2 crowns from 2013 through 2017 before capturing the Division I title last winter. Lakewood St Edward defeated Cincinnati LaSalle by a 29-28 count for the Division I title. LaSalle won the first five bouts and was up 19-0 in the D-1 final. Visit baumspage.com for complete results from the seventh annual OHSAA state wrestling dual team tournaments held at St. John’s Arena.